“but isn’t the latency between the sites defied the point of using an AFA like EMC XtremIO” ?? you can leverage the VPLEX RecoverPoint splitter replicating to a remote site in an async fashion, in fact I have just the customer that is doing this to tell you about.. The Tel-Aviv-based Clal Insurance is Israel’s leading insurance, pension, and financial services group. The Clal Group holds a 19% share of the Israeli insurance market and manages hundreds of billions of shekel-denominated assets. Haim Inger is the CTO at Clal Data Systems, the IT company that provides all IT services to Clal Insurance. For Inger, the main storage-related challenge facing his organization was end-ofmonth reporting on the life insurance systems. Even with high-end storage in the data center, these core applications needed better performance. This situation was costing Clal Insurance an estimated $900,000 per year in lost business and productivity. Inger could see that the main bottleneck was storage, and he was looking for a solution that would make it possible to finish these jobs much earlier. The answer was an EMC XtremIO All-Flash Array. Clal Insurance started by deploying a two X-Brick cluster (X-Bricks are the basic scale-out building blocks of XtremIO arrays) and replicating them locally with EMC VPLEX to another two X-Brick cluster. 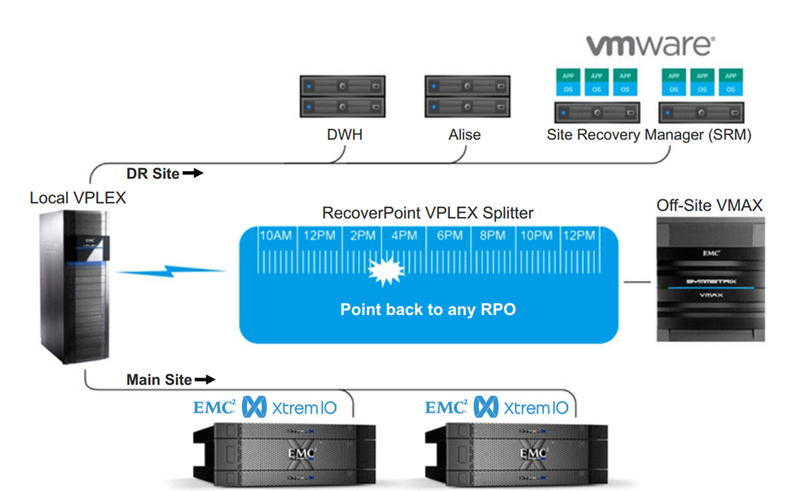 The local VPLEX replication of the X-Bricks was in addition to a full disaster recovery (DR) backup system, using EMC RecoverPoint. demanding scenario, which is end-of-year reporting,” Inger continues. “On a usual basis for end of year, we would be shut down for 24 hours. Thanks to XtremIO, we were able to open the systems at 6:20 a.m. on January first of this year. Even with local replication using VPLEX, plus RecoverPoint backup to our DR site, the reporting goals and online day-to-day work were not affected. We don’t see any impact at all. storage they had on the premises. This approach resulted in small gains — instead of 2:00 p.m., the jobs finished at around 12:00 p.m. — but it was not enough. Then they started looking at All-Flash Arrays, including XtremIO, and others. Specifically, the best average read time on the company’s existing high-end storage was about 5ms. Clal Insurance was looking for at least 3ms; they achieved 1.5ms with XtremIO. everything about backup and DR. What’s more, the management is any storage guy’s dream. XtremIO is the simplest storage system I ever saw anywhere to manage. Inger purchased several additional X-Bricks recently. “All of our database virtual machines are going to reside on XtremIO,” he says. In summary, XtremIO is used for two main purposes at Clal Insurance: The first is to accelerate the day-to-day use of applications and to super-accelerate the nightly and end-of-month jobs of the life insurance applications. The second is to accelerate the deployment of the company’s virtual servers with as small a footprint as possible on the storage side. Next Post Next post: VSI (Virtual Storage Integrator) 6.2 is Out, XtremIO is IN! Hi, you’re not mentioning the “unmap” integration issue between VPLEX and XtremIO. Any update on the roadmap for this implementation? yes, VPLEX UNMAP support is coming in 2015.